There are many benefits that come with roommates: the ability to rent a larger space, share cleaning duties, and easily find friends to watch a movie with. On the other hand, sharing a space with a roommate – or roommates – is not always easy and can bring on some challenges, especially when it comes to money. Here are some tips to help you split the bills and keep the peace. Just as your lease spells out every detail, consider working together with your roommates to create some ground rules or guidelines. This is a good time to discuss exactly which expenses you will be sharing and which you will be paying for individually. A major key for keeping the peace is making sure bills are organized. Figure out when and how bills will be collected and split each month, how they will be payed, and who is responsible for paying what amount. While this may sound obvious, too many times roommates will wait until the last minute, causing stress, tension, and possibly late bills. 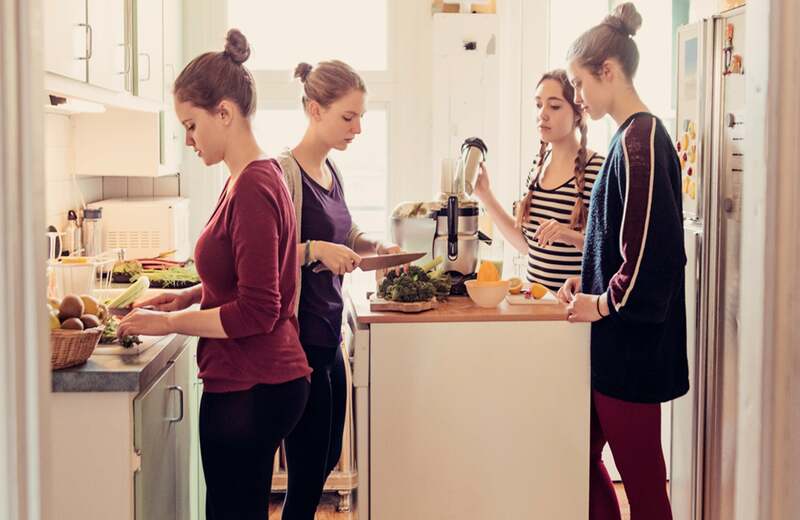 Once ground rules and guidelines are created for paying the bills, make a spreadsheet outlining each expense you and your roommates will need to pay. Each expense should show details such as due dates, the amounts owed, and the person responsible for paying. It may be wise to have a monthly meeting to discuss the bills and this spreadsheet. This will make sure everyone is on the same page and no one is surprised by a bill when it’s time to pay. There’s always an app for that! When you have large expenses, such as rent or utilities, consider using an app that can help with the math and the payments. Gone is the excuse that a roommate “doesn’t have cash” on them as Venmo can easily solve that issue. This free app lets you send money from a debit account to friends. The app also lets you request money letting your roommates know that money is due. Another great app is Splitwise. This app lets roommates track bills, tally who paid, and send reminders so you’re never late. If a cost spreadsheet is too old-school for you, consider using an app to make paying bills easier among you and your roommates. Unless you and your roommates plan on selling everything when the time comes to move out, consider buying furniture separately. While it may sound logical to split furniture costs that you both will be using, what happens when your lease is up? Deciding who gets to keep what can be stressful and problematic. Consider making a list of furniture and electronics necessary for your place and figure out who will be responsible for each item while keeping your overall costs even. Like furniture, groceries are another item which roommates should consider buying separately. If you love to eat fresh foods while another roommate loves frozen pizzas, splitting the costs won’t exactly be even. This also creates controversy when your roommate decides they want fresh food that day and indulges in your groceries. Obviously you won’t want to live with someone who you’re going to constantly clean up after. You also won’t want to live with someone who will never pay their share of the bills. Doing so could end up hurting your credit, especially if they skip out and you can’t afford the rent on your own. You may want to request that they check their credit scores and you can do the same. That way you’ll know what their history of paying bills is like (you can get your credit scores for free on Credit.com). While it may be hard to know your possible future roommate’s habits, at the very least, consider meeting with them beforehand so you can feel them out. You won’t want to be stuck in a lease with someone you’re going to regret living with. Leslie Tayne, Esq., is a consumer and business debt-related attorney and advisor. She founded Tayne Law Group, P.C., concentrating solely in debt resolution and alternatives to filing bankruptcy for consumers, small business owners and professionals. In addition, Tayne Law regularly consults and advises on debt management related issues. Her book, Life & Debt, shows how learning to embrace your debt can help you not only like it, but love it.